In this tutorial you will learn to make direct connection between your Arduino and Matlab, so that you can program your Arduino directly through Matlab. It is very useful when you are working on complex robotics like Robotic Hand, Humanoid etc. as you can process your complex program on your PC in Matlab and then directly program the results in Arduino. Hardware: ARDUINO UNO, power supply (5v), 100uF capacitor , buttons (two pieces), 1KΩ resistor (two pieces), EM-18(RFID reader module), LED, JHD_162ALCD (16*2LCD). In the circuit, you can observe that I only took two control pins as his give the flexibility of better understanding. The contrast bit and READ/WRITE are not often used so they can be shorted to ground. This puts LCD in highest contrast and read mode. We just need to control ENABLE and RS pins to send characters and data accordingly. Before going to further we need to understand about the serial communication. The RFID module here sends data to the controller in serial. It has other mode of communication but for easy communication we are choosing RS232. The RS232 pin of module is connected to RXD pin of UNO. 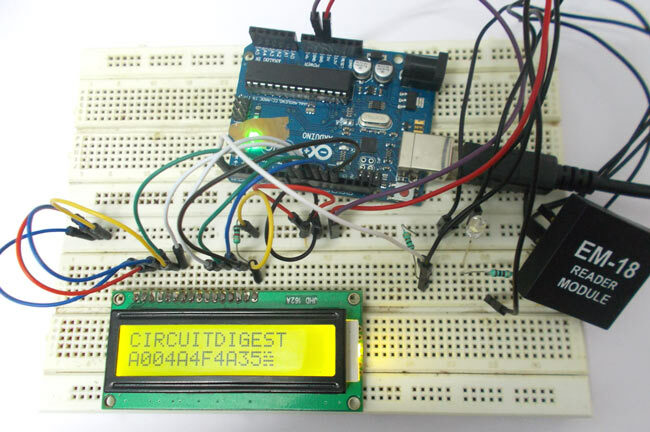 Now for setting up a connection between RFID reader and Arduino Uno, we need to enable the serial communication in UNO. The serial communication enabling in UNO can be done by using a single command. As shown in figure above, the communication of RFID is done by a BAUD rate of 9600 bits per second. So for UNO to establish such baud rate and to start serial communication we use command "Serial.begin(9600);". Here 9600 is the baud rate and is changeable. Now once data is received by the UNO, it will be available for taking. This data is picked up by command “data = Serial.read();”. By this command serial data is taken to ‘data’ named integer. Once a card is brought near reader, the reader reads the serial data and sends it to UNO, the UNO will be programmed to show that value in LCD, so we will have ID of card on LCD. lcd.setCursor(0, 1);//move courser to start.